Herbert John Blythe was born on 17 September 1887 at Market Street, Downpatrick, County Down, the first of two children of hotel keeper George Blythe and his wife, Swiss-born Elise Corinne (nee Favre-de-Villairs). His father died of influenza when Herbert was just 5 years old and three years later his mother married bank official William Alexander Taylor. Herbert was educated at the Royal School, Raphoe, County Donegal and in May 1904 was employed at the Northern Bank, working variously at the Newry, Ballymena, Grafton Street, Head Office and Carrickfergus branches over the following decade. Blythe enlisted in the North Irish Horse at Antrim on 23 November 1915 (No.1955). In November the following year, together with around 100 other North Irish Horsemen, he volunteered to transfer to the Royal Irish Rifles. The transfer took place on 7 December 1916 – Blythe was issued regimental number 40857 – the day they embarked for France. There they were posted to the 1st Battalion, Royal Irish Rifles, joining it in the field on the Somme front a few days later. Blythe was posted to C Company. On 26 December he applied for a commission in the infantry and left the battalion for officer training in England a week later. He reported for duty at No.20 Officer Cadet Battalion, Haig Hutments, Crookham, Hampshire, on 6 February 1917. 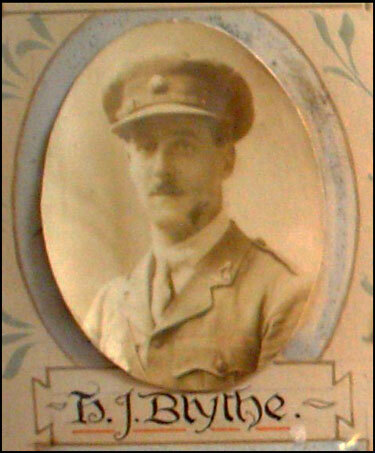 Blythe was commissioned as a 2nd lieutenant on 30 May 1917 and posted to the 18th (Reserve) Battalion, Royal Irish Rifles. Later that year he was transferred to a regular battalion of the Rifles. One record states that he later served with the Egyptian Expeditionary Force, where he was seconded to the Camel Corps, seeing action at Gaza, Heriera, Beersheba and Jericho. Blythe was promoted to lieutenant on 30 November 1918 and relinquished his commission on completion of his service on 8 July 1919. He rejoined the Northern Bank at Head Office the following month, later transferring to Lurgan (1919), Grafton Street (1922) and Head Office again (1930). Whilst in Head Office he was promoted to Manager, Foreign Department (1930), Assistant Chief Cashier (1940) and Chief Cashier (1941). On 28 April 1920 he married Clara Adrienne Murray of Ardkeen, Greenisland at St Patrick's Parish Church, Jordanstown, County Antrim. Blythe's half-brother, Cyril William Taylor, also served in the North Irish Horse and worked at the Northern Bank.